First they ignored us, then they laughed at us - now they are scared to death of us. (8) MSM is batshit-crazy about Q. 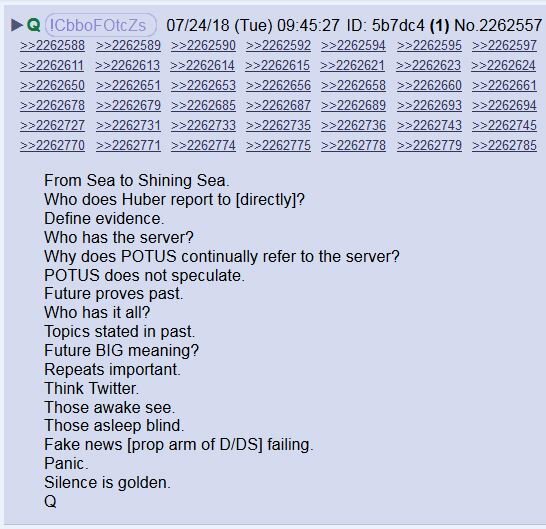 (12) 5 minutes after Q posts, POTUS was in this event with "America the Beautiful" playing the lines "From Sea to Shining Sea"
YAY! Q is back! Here’s my full dig on the new posts! #QAlert 7/24/18 #NewQ! This will be my THREAD for all of #QAnon posts for Tuesday, July 24, 2018. Silence is Golden, more than you know, mirrors and disinfo, we do try, we saw you, wonderful day and more! On the 20th day since their last Drop, Q returns.